10, Yershova Str., Spassk-Dalny, Primorskii Krai, 692210, RUSSIA. Model, Design, computer treatment by "Zov Taigi" Center for Defence of Wild Nature via financial support by WWF and USAID. Publishing House "Dalnauka", Vladivostok, Radio Street 7. Edition of 2000. The Reserve, consisting of 37,989 hectares, is located in the centre of Prikhankaiskaya Lowland. The dominant habitats of the Reserve are grassy bogs, meadows, reed thickets and shallow. In addition to the main territory, the "Khanka" Reserve has a buffer zone where agricultural and other activities are partially or totally prohibited. Altogether, protected areas covers 110,000 hectares. 334 species of birds have been recorded in the Reserve and its adjacent protected areas. Most of them are classified as endangered species; 49 species have been included in the Russian Red Book and 12 species in the International Red Book. In consideration of the number of bird species and the number of rare species, the Reserve has a leading position (among equally sized reserves) not only in Russia but also within all protected areas in temperate Europe and Asia. Of the 43 mammal species recorded in the Reserve, two species are registered in the International Red Book and an additional two species are registered in the Russian Red Book. One species of reptile and two species of fish are also registered in the Red Book. The Reserve has vital importance for the preservation of 9 species of vascular plants which are endangered or rare in the Russian Far East. Khanka Lake is the largest freshwater lake in the Russian Far East. It is very shallow despite its large surface area of approximately 4,070 sq.km. The average depth of the lake is between 4 to 5 meters; the maximal depth is 10 meters. The water level changed periodically in the last 26 years: amplitude of its variation can reach 210cm. In this case difference in water surface area is about 17% and water volumes is 39%. Since 1993, the Reserve has been compiling the Chronicles of Nature, in which all events and changes of the Reserve are listed. The Chronicles assists in the study of trends of natural history changes and/or in the comparison of the Reserve with non-protected areas. This provides a scientific base for the biodiversity preservation and optimal use of natural resources in the region. Researchers of the Reserve conduct environmental education and organise different cognitive excursions by foot, boat, and car. The unique ornithofauna of Khanka Lake made is possible to establish the Reserve. Most of the species are registered breeds in the Reserve itself, however, quite a large number of birds make a stop at the Lake during seasonal migrations. At such times, the number of ducks, for example, can reach hundreds of thousands. Among all birds in the Reserve, the crane is considered to be the most rare and endangered. 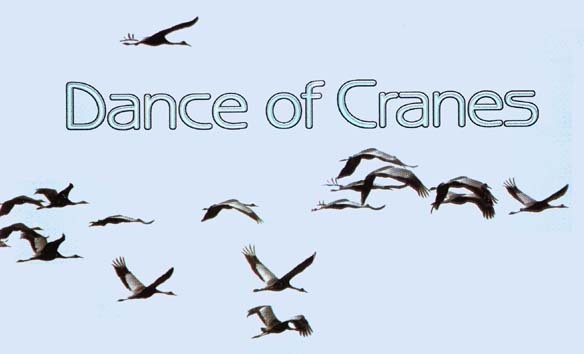 All 4 species of crane recorded in the Reserve are being registered in the International Red Book. While Grus monachus and G. leucogeranus can be seen during migrations, two other species, namely white-napped (Grus vipio) and Japanese crane (Grus japonensis) nest in the protected lands of the Reserve. The Japanese crane serves as a symbol of the Khanka Reserve and is therefore shown (depicted) on the Reserve's emblem. The Japanese crane is the largest species of cranes recorded in Russia. Its large size helps in resisting numerous predators. The weight of the bird is about 12kg and height is 170cm. Its body colouring is usually snow-white, whereas the neck and apex of the wings are black. The crane has a red "hat" on top of its head. The bird is elegant and therefore admired by many people. The Japanese consider this crane to be a sacred bird. Many kinds of classical and applied arts of Japan are illustrated with the crane's image. This species is only found in the Far East territory. There are a little more than 1000 individual birds in the world. 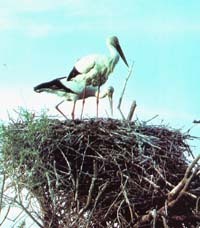 The Far Eastern white stork (Ciconia boyciana) is a close relative of the European stork. But unlike its European kin, it is an endangered species and is registered in the International Red Book. The Far Eastern stork is bigger than the European stork, has a black bill and somewhat different coloration of the wings. The Far Eastern stork only inhabits wilderness. Presently, C. boyciana breeds in Russia and north east China. The last breeding birds to be recorded in Japan was in 1959 and in Korea - in 1971. It is pleasing to note that after establishing the "Khankaisky" Reserve, the number of breeding pairs has gradually increased. 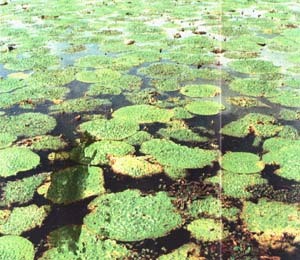 In general, lotus (Nelumbo nucifera Komarovii) grow in South-East Asia and Australia. Within Russia, the lotus is known to be found in the Primorsky and Khabarovsk Krais and the Volga River Delta. Such an immense and disjunctive range is evidence of the ancient origin of the lotus. The lotus bloom reaches its peak in mid-August. For 3 to 4 days, the lotus flower blossoms every morning and closes every evening. Afterwards, the petals of the lotus bloom will turn from bright pink to almost white. 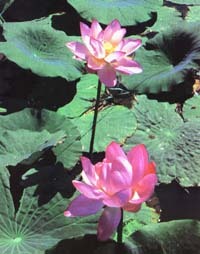 The lotus bloom with always face the sun, which is why this plant was idolised in Oriental countries. Euriale Euryale ferox is a relic species. Outside Russia it is found in South-East Asia; within Russia it inhabits the Ussuri and Ilistaya river valleys. It was named "frightening" because of the sharply pointed spines on the floating leafs. Round-oval leafs reach a diameter of up to 130cm. They are bright green on top and violet on the bottom. The flowers are large and goblet-shaped. In the morning, they rise to the surface and then go down under the water where the fruits reach maturity. Striated (green-backed) heron Butorides striatus is a rare species of bird in the Khanka Reserve. As they are a nocturnal species, it is very difficult to observe them. In the last few decades, the only known case of nesting of this bird was in Russia's Far East territory. In 1994, however, 15 pairs of nesting striated herons were found in the Khanka Lake basin and in 1996 - more than 30 pairs. 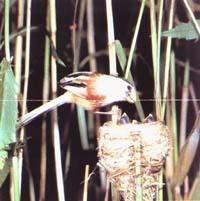 An interesting ornithological founding was made in 1968, when a new species of Russian fauna, Yangtse (Heude's) parrotbill Paradoxornis heudei, was discovered in a reed thicket of Khanka Lake. Up to now, this species was only found within Russia at Khanka Lake; there is slightly over 200 known individuals. This species is listed in the International and Russian Red Book. The water-marsh territories of Khanka Lake basin are a unique nature complex where different species of birds build nests or stop to rest while flying through this area. There are many rare and interesting meadows and marsh plants. The first proposals to establish a protected area in this region were made in the 1920s. A long and compliated battle has been fought by the defenders of nature. Finally in 1990, a state nature reserve was established, makin this Reserve the youngest in the Primorskii Krai. Since 1971, according to the Ramsar convention, this territory was given the status of the wetlands of international importance. 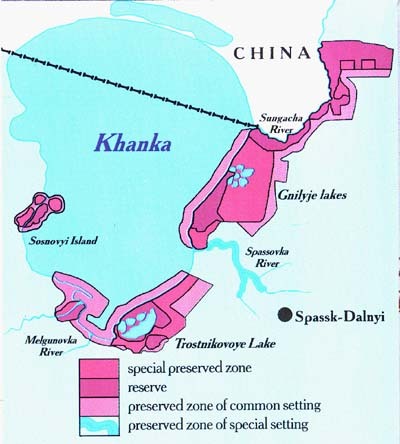 In April 1996 an agreement between Russia and the Chinese People Republic was signed which established an international Russian - Chinese Reserve on the territory of the Nature Reserve Khankaiskii in Russia and the Sinkai-Hu Reserve in China. Usually it is difficult to distinguish between the male and female crane when they stay close together and hunt for frogs. Suddenly, they stop hunting and turn their beaks to one another. Then, one of them begins to bow, extending its neck to its partner and slightly turns. Shaking his head and neck up and down, the male clasps his wings and slowly dances near the female. The tempo becomes more intense with every new turn. Then, both of them, standing opposite each other, jump up and clasp wings. At this time, the left leg, slightly higher than the right leg, kicks in the air. The height of the leap can reach approximately 2 meters. In apogee of the leap, the birds expand their wings very widely; at this moment it appears that the birds are flying in the air. Sometimes, the birds jump especially high and the "dancing flight" follows: side by side, they slowly and gracefully fly down and land approximately 40m from the place where they started. Afterwards, the birds usually stop their dance, shake themselves and again begin to walk on the meadows. There is yet another interesting pose of the white-napped crane's dance. While dancing, the birds often take small things from the ground: sticks, dry grass, corn and even scraps of paper. In this other pose, the dancing bird jumps to its partner and expands its wings backwards as wide as possible. A black edging which contrasts the white colour of the wings is then visible. Sometimes the birds will stand still before each other and press their beaks to their own chests showing red points on the surface of their heads. Then, they raise their wings a bit, their beaks in the direction of the sky and begin a piercing cry. When the entire flock is dancing, the birds cheer themselves by crying.